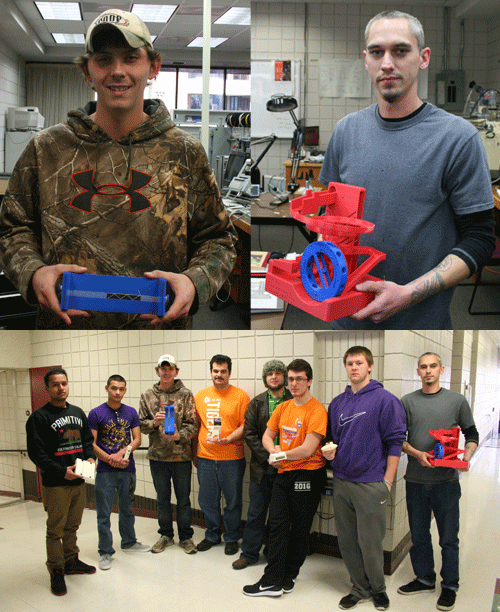 As part of Cowley College’s Computer Integrated Manufacturing (Mechatronics) course students were recently challenged with six builds in SolidWorks, a computer aided drafting program. Starting from simple boxes the students were given progressively harder projects for a quarter of the class and then were asked to design a product to “sell”. As part of the final day of the class, students conducted sales pitches of their products to each other. The students developed the products on the cad while also going through the V-Model of design and checking for patents and comparable competitors. A few of the products students made were, a miniature pinball machine, a beading loom, a case for a game system, and a marble run.